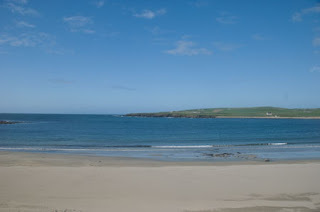 The Orkney islands lie off the northeast coast of Scotland. 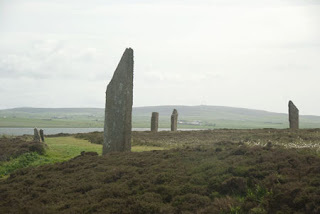 Seventy or more islands form Orkney. 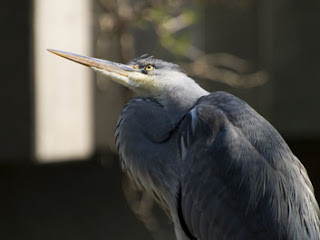 These islands have a rich and varied history going back as least as far as 5000 years. 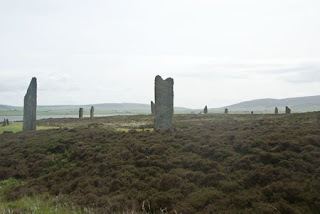 Orkney is a fantastic place to undertake a little time travel. 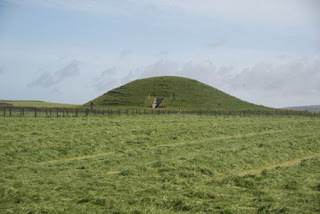 Neolithic, Bronze Age, Iron Age, and Viking sites cover these islands as well as Medieval churches, Renaissance palaces and WWII bunkers. Today we did a bit of the Neolithic Age on the west mainland of Orkney in addition to exploring the rich natural history of this area. We then headed out to Marwick Head, complex of sandstone sea cliffs. 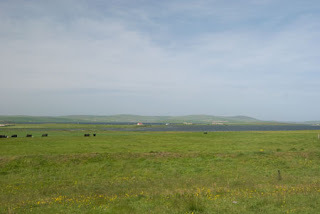 The geology of Orkney is dominated by flagstones and sandstones formed from fresh water lake deposits some 400 million years ago. The sediments that form the Old Red Sandstone of Orkney are one of the best examples of a Devonian Age lake basin in the world. Over time the sandstone has been carved into dramatic cliffs, arches, and stacks by the sea. In summer, these cliffs are the breeding grounds for thousands of sea birds. 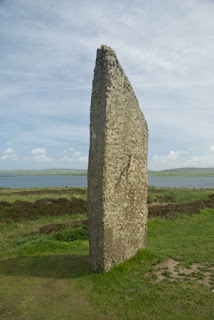 One of the largest being Marwick Head. 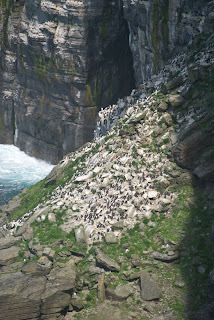 More than 25,000 Guillemots and 5,000 pairs of kittiwakes crowd the cliffs here. 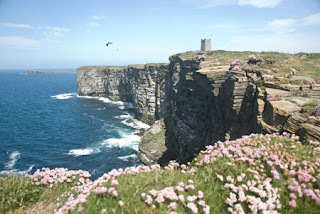 Marwick Head adorned by sea thrift. Exposure to rough weather, rough waves, and salt spray create an challenging environment for plants on the cliff tops. 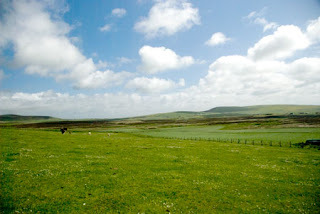 Here you find maritime heath, characterized by low-growing heather, sedges, grasses and wild flowers. Where it is too salty for heather to grow, along the cliff edges, salt tolerant thrift abounds. We climbed up along the sea cliffs for a great look at Guillemots in their hundreds, as well as Puffin, Razorbill, Fulmar, and Kittiwake. Traveler Three and I saw a wheatear on the way up the cliffs. We then stopped at Fluke Jewelry. Brilliant stuff. Our last stop of the day was the amazing Skara Brae. 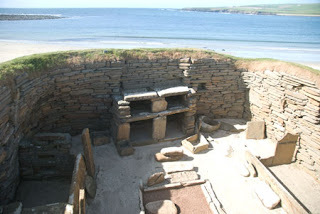 The Neolithic village of Skara Brae sits on overlooking the Bay o'Skaill. The settlement is 5000 years old and consists of eight houses linked together by passageways. This well preserved site gives the visitor a truly amazing glimpse into life in the Neolithic, one filled with warm hearths, little box beds, and even built in dressers. 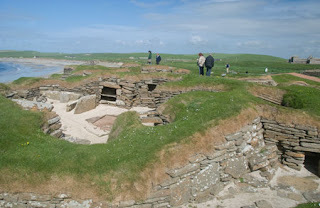 The inside of one of the dwellings at Skara Brae. Note the stone dresser. 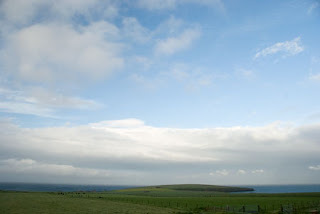 Then it was back to the farm for a spectacular meal, and an evening of watching the ever-changing sky and sea of Orkney. The sea and sky change every five minutes. You never know what you will get. It changes from blue as blue can be, to dark and stormy, to silver with the sun spotlighting a moire pattern on a green sea, back to blue as blue can be and then something entirely different than what came before, ever cycling, ever changing, and ever different. It is hypnotic and entrancing and I'm in love with it. I want to stay on the couch in the conservatory at Gerraquoy forever and watch the sea and sky and the clouds pass by.